Sometimes, all it takes to win in this league is a hot goalie. For the Rangers, they got exactly what they needed in a close to the vest 3-2 win over the Flyers in the NBC feature game on Black Friday. Henrik Lundqvist made a season high 40 saves to lead the Blueshirts to an important bounce back win in the City of Brotherly Love. They built a three-goal lead after two periods before the Flyers started their comeback. In a seesaw first period that saw Lundqvist stop all 11 Flyer shots, it was the opportunistic Rangers who soared ahead thanks to tallies from Derek Stepan (4th) and newcomer Matt Puempel. Prior to the offense, there actually were some fireworks. Brandon Pirri picked up a boarding minor which resulted in Flyer rookie Travis Konecny challenging him to a fight. It was the first scrap for the Rangers in Game 22 of 82. Let’s just say the tough Flyer first-year player can handle himself. However, Konecny’s instigator negated a Flyer power play. A crucial part with Philly ranking second on the man-advantage. A few minutes later, J.T. Miller fed Stepan from behind the net for a lay-up. It didn’t take long for Puempel to make an impact. Making his Rangers debut in place of Oscar Lindberg, he took a nice lead backhand pass from rookie Jimmy Vesey and beat Steve Mason 1:34 later for his first as a Blueshirt. That increased the lead to 2-0. I’ve dubbed him Puempernickel. He definitely is a shoot first forward with a scorer’s touch. Hopefully, it works out better than Ottawa. Before the period concluded, Chris Kreider got into it with Flyer defenseman Brandon Manning. After he delivered a clean hit on Manning against the boards, Manning did the right thing and dropped the gloves. Kreider obliged and got the decision with a big left that knocked Manning down. Kevin Hayes scored the lone goal in the second to put the Rangers ahead 3-zip. He finished off his 10th from Nick Holden at 12:33. The third-year center continues his big turnaround season. The goal gave him 100 career NHL points. Interestingly, there were no penalties called after the first. The Rangers chose to sit back in the third. It almost proved costly. The Flyers mounted a comeback by peppering Lundqvist with 21 shots. He was tested early and often. His 19 saves were the biggest reason his team came out victorious. Lundqvist made a lot of big stops to keep his team up two. With under three minutes remaining in regulation, the Flyers pulled Mason for an extra attacker. Shayne Gostisbehere was able to beat Lundqvist through traffic to make it a one-goal contest with 2:04 remaining. Considering that I had gone from reaching an agreement on a new car with Honda to working a six-hour shift, I had that “Uh oh” reaction when I saw that Gostisbehere had scored. It didn’t take a brain surgeon to figure out that the Rangers were holding on for dear life. According to those who watched, they crowded the net and allowed Gostisbehere and teammates to fire away from the point. It led to five shots and one goal. Fortunately, they were able to get the win despite being outshot 42-23. The difference being Lundqvist, who some cynics have written off. Amazing how ridiculous our fans are. Teammates congratulate Henrik Lundqvist following a season high 40 saves that bailed the Rangers out in a 3-2 win over the Flyers on Black Friday. 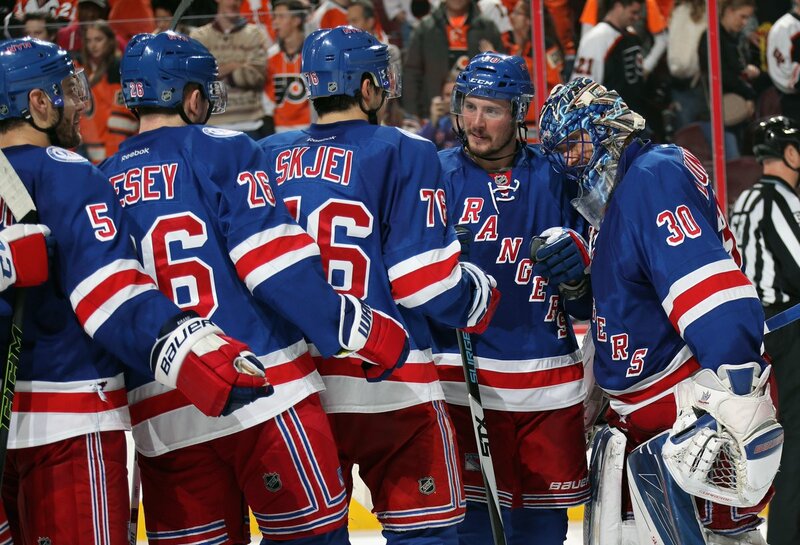 AP Photo via Getty Images courtesy NYRangers. There are going to be games where this team isn’t at their best. Clearly, they were embarrassed by the Turkey Eve showing where the Pens outclassed them. Today, for two periods they buried their chances and were only six shots down (21-15) before the predictable Flyers onslaught. The Rangers have played a lot of hockey. This was their 22nd game and the fourth over six days. They have been very busy lately. So, it wasn’t how you draw it up. What’s important is that Lundqvist got them the win. He is still capable of stealing games. The defense also blocked 27 shots. So, the team certainly sacrificed for the cause. Obviously, they’re falling into a bad trend where they’re playing too much in their end. That needs to change. The defense isn’t great. Everyone knows it. Opponents will continue to try to exploit it with a ferocious forecheck and by finishing checks on our D. Particularly Marc Staal, Nick Holden and Dan Girardi, who aren’t the fleetest of foot. Neither is Kevin Klein. At some point, Alain Vigneault needs to get Adam Clendening back in and rest either Girardi or Klein. He’s a younger righty skating D who can help get the puck out and play power play. Speaking of which, they were handed an early double minor when Dale Weise high sticked Holden 17 seconds in. The power play hasn’t been as effective minus Mika Zibanejad and Pavel Buchnevich. Losing Zibanejad’s powerful right-handed shot from the off wing hurts big time. He always had to be accounted for due to his one-timer and top heavy shot which opened up passing lanes and rebounds down low. Buchnevich brought plenty of skill on the opposite side. It’s hard to replace what each brought. Looking at the stat sheet, the teams combined for 67 hits with the Rangers holding a 37-30 edge. You don’t expect pint sized Mats Zuccarello to be your leading hitter with half a dozen. But also, hits increase when you are pinned in your end. Zuccarello was on for two goals against. He’s not the best defensive player. He competes as hard as anyone. But you want him on the attack in the offensive zone. Not defending. It seems that when Josh Jooris plays in a fourth line role, he does something to stay in the lineup. He started the play that led to Vesey setting up Puempel’s first as a Blueshirt. Similar to Lindberg, the former Flame is only getting even strength time receiving 9:21 in 19 shifts. However, he’s making the most out of it which is why he stays in the lineup and Lindberg doesn’t. It really is a shame about Oscar. But he looks like he’s on the outs. Stepan played one of his better games netting his fourth from Miller while attempting six shots in 29 shifts (19:52). He also won 13-of-22 faceoffs. Without Zibanejad, they need him to be that guy. Even though he had an assist, Wayne Simmonds was limited to one shot. A big win considering how he usually dominates the front of the net against us. Somewhat curiously, Michael Del Zotto was a healthy scratch for a third straight game. I don’t see how that’s possible given the Flyers blue line. You’re gonna tell me MDZ isn’t a top six defenseman over MacDonald? Odd. The Flyers are still without Michael Neuvirth. Anthony Stolarz continues to back up Mason, who took the loss with 20 saves. In what’s been an unusual schedule, the Rangers don’t see the Flyers again until Jan. 4, 2017 at Wells Fargo. The Flyers visit MSG Jan. 25. The fourth and final meeting isn’t until Apr. 2 at 33rd and 7th. What would you expect from the schedule makers where the Hurricanes visit the Rangers twice on within a four-day span on Nov. 29 and Dec. 3 to complete the season series?Carolina took the first one in Carolina 3-2 on Oct. 28. They’ll be done with them before finally seeing the train wreck that is the Islanders on Dec. 6 in Brooklyn. They’ll also finally play the Devils twice with the first one at MSG 12/11 and the second meeting also on Broadway exactly a week later on 12/18. The Rangers next play the Senators on Sunday night at home. Craig Anderson is having an inspiring season with his wife battling cancer. They’ve played better winning the last two by scoring four times in a win over Montreal and three more in a home win over Boston. Old friend Derick Brassard makes his MSG return. He’s off to a slow start with three goals and six assists. He is centering talented wingers Mike Hoffman and Mark Stone. None have really lit it up except for two-time Norris winner and captain Erik Karlsson, who leads them in scoring with 16 points (4-12-16). Kyle Turris paces them with nine goals. In 15 starts, Anderson has 10 victories with a 2.23 goals-against-average, .929 save percentage and two shutouts. This entry was posted in NYRangers and tagged Black Friday, Brandon Manning, Brandon Pirri, Chris Kreider, Chris Vandevelde, Derek Stepan, Flyers, Game recap, Henrik Lundqvist, Kevin Hayes, Matt Puempel, NYRangers, Shayne Gostisbehere, Steve Mason, Travis Konecny. Bookmark the permalink.